Every guy needs a space to call their own. A fully stocked man cave can be the sanctuary a guy needs after a long day of work. With the right equipment, guys can turn their space into a place where friends can let loose and have fun. When it comes to filling your man cave, the options are limitless. Here are 10 ideas that will complete your man cave and turn it into a prime hangout spot. The future is here! Virtual reality is hot right now. There are many devices available that provide a truly immersive experience. What was once only a dream is now readily available for everyone. Whether you are looking to watch a movie or play a video game, devices like the Oculus Rift will let you step into a virtual world. The Oculus Rift allows gamers to step into their favorite game world to fight off enemies, solve puzzles, and explore. If you’re looking for a simpler and more economical option, you can easily create your own virtual reality glasses. Cardboard templates allow you to create a DIY alternative that works with your mobile phone. 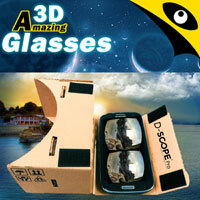 Simply download an application and slip the phone into the cardboard glasses to experience a new world. Is there anything cooler than shooting life-sized zombies, cowboys, and a slew of other villains in the comfort of your own stomping ground? You can be the master of your own domain and fend off enemies on the big screen. All you need is a gaming console that supports motion control, a rear projection screen, and a projector. Any projector will work, but you’ll have to use the right type of screen that allows the image to pass through from behind. You can get the right type of screen here. Alternatively, you can craft your own DIY rear projection screen using the right materials here. They give you the ability to move around the room to shoot your enemies without having to worry about casting shadows. The overall brightness and image quality will provide you with an immersive playing experience. Not only that, but the setup is incredibly versatile. You’ll be able to use it for the next two ideas on this list. Is it really possible to create an indoor golf course? With the right equipment, it is absolutely possible. Who needs to spend time on a real course when you can easily create a beautiful golf course in the comfort of your own home? With a rear projection system and the Optishot 2 golf simulator, you can play a full 18 holes in your man cave. 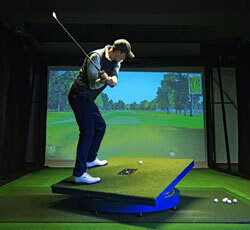 The Optishot 2 golf simulator uses a golf pad with realistic grass to provide you with a faithful golf experience. 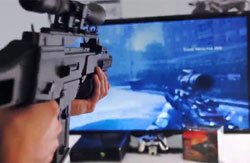 It uses infrared technology and 3D software to make the game feel true to life. With a large rear projection screen, a variety of beautiful courses from around the world will come to life. You can master your swing and challenge friends to a competitive game of golf on amazing courses without leaving your sanctuary. 3D visuals can create a relaxing atmosphere. Whether they are used as background visuals while you are playing a game of poker and having a drink or as the main event of entertainment night, these visuals are sure to leave you and your friends in awe. No man cave is complete without a fridge. Guys need to have a refrigerator close by so that drinks are easily accessible in between games on the big screen. There’s a wide range of refrigerator options available. However, glass door refrigerators are a great choice. 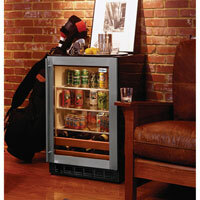 These refrigerators are specially designed to house all of your beers and beverages. They usually come with can racks to keep your drinks organized and in full view, ensuring that you are fully stocked at all times. Glassdoor refrigerators come in a number of different sizes, each holding varying numbers of drinks to keep everyone hydrated. If you are a skilled DJ, this one is a no-brainer. If you’re not, a DJ booth will give you a chance to become one. Not only do DJ booths provide some much-needed jams for hangouts and get-togethers, but they give guys a chance to brush up on their spinning skills and take command of the entertainment. You can reserve some space in your man cave and build a custom DJ booth for ultimate control. Personally, vinyl records and an old-school turntable is the way to go. They are the real deal, providing you with that true analog sound you can touch. 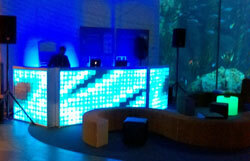 However, a ton of great DJ systems are made for the modern world. These systems work with streamlined audio from a laptop, DVD, or CD. They provide easy access to your entire music collection and allow friends to contribute their own jams. 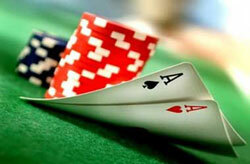 Poker has become hugely popular over the last few years. Why? Because it’s an exciting and competitive game to play! Guys can challenge their friends and go all in to win all the chips. It’s a thrilling game that will have you and your friends constantly putting on their poker face. Poker tables are a classy addition to any man cave. 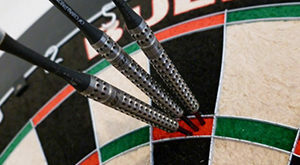 They are designed to accommodate multiple players and make the most out of a game. You can bring the look and feel of a real casino into your space. Poker tables can be as elaborate or as simple as you desire. You can even go with a foldable option to save some space or a stationary one to designate an area for card playing. If video games are your thing, a video game chair is a must have. Not only are these chairs incredibly comfortable, but they have additional features that improve the overall gaming experience. They can hook up to your gaming console so that they react to your gameplay. 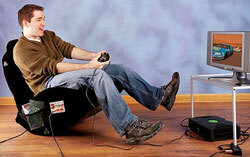 There are many varieties of gaming chairs available, from plush and technologically advanced to simpler rocker chairs. Many options have speakers located on the headrest to deliver high-quality audio directly to your ears. Others have vibration features to make it feel like you’re in the heat of the action. When paired with a large rear screen projector, your man cave will become the ultimate gaming paradise. If you deal with stress on a regular basis, you can place a boxing bag in your man cave and punch it into tomorrow land. Not only do boxing bags serve a useful purpose, but they are a super cool accessory that adds a masculine touch to any space. Furthermore, they can help guys keep their physique in check. Place a punching bag in your space and introduce it into your daily workout to build some muscle and keep the stress at bay. Punching bags are relatively cheap and compact, taking up only a small bit of space. You can find some solid punching bag options here and proper gloves here. Nowadays, everyone has a mobile smartphone or tablet. They are great gadgets that contain a world of entertainment at your fingertips. That being said, they need to be charged in order to work. You can keep the juice flowing with a charging dock in your space. If you have friends over, they’ll more than likely run out of power and need to use a charger. A Universal Multi-Device Charging Station will have you and all of your friends covered. It can charge multiple devices at the same time and keep everything organized. Say goodbye to a tangled mess of chargers on a power strip. A charging station works with virtually any device on the market today. It’s cool, handy, and worry-free.